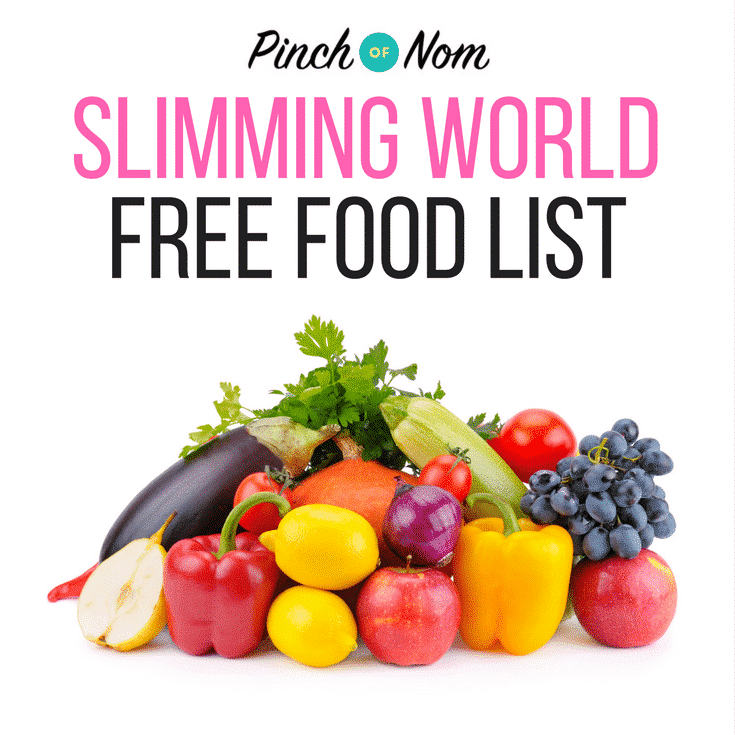 We asked members of our Facebook group what would help them on their Slimming World journey, lots of them wanted a Slimming World Free Food List! Free Foods are a vital part of the Slimming World Extra Easy plan and the Slimming World SP plan. It’s what makes up the bulk of what you eat on the plan. A perfect Slimming World plate will have one third of Speed Foods, and two thirds of Free Foods. Including a variety of Free Food into your meals will help you maintain your weight loss and ensure that you’re Food Optimising 100%. Come join our Facebook group! We have over 300,000 members, who want to help you! You wouldn’t want to miss out on the fun would you? These fruits are only Free Food when eaten in their raw state, either fresh or frozen. These vegetables are only Free Foods when cooked without fat or oil, either fresh, frozen, canned or pickled. Fish is a Free Food as long as it’s cooked without using fat. Mackerel (Fresh, Canned in Brine or Tomato Sauce) Not smoked. Meat & Poultry are Free Foods when cooked without oil or fat, and prepared very lean. Hi, can I ask about buckwheat? From the list I’m guessing it’s a free food but I’ve had some comments about the buckwheat porridge I made this morning which is making me second guess myself. All I did was take 1 cup of whole buckwheat and simmer in a water/milk mixture with cinnamon sticks which were removed after cooking. Will this cause the buckwheat to have a syn value? I know there is the hexA component but is there anything else. Many thanks have been stressing all day over my sun’s? By using buckwheat in this way, you’re substituting it for cereal or oats. Potentially you could end up eating more than you should, as you’ll still be consuming another HEB choice. This is where the tweak factor comes in. It’s always best to check with your consultant if you’re not sure. Is tinned cod roe free or does it need to be fresh? Theoretically tinned cod roe with nothing added would be free. You’d need to check that it’s tinned in brine, rather than oil or water that contains sugar. For accurate Syns information, please contact Slimming World. Hi is Glaceau lemon smart water sparkling free? On SW website smart water is but no mention of flavoured ones. I didn’t see any free from foods on your list, I’m asking for my partner whom is trying to loose weight. I myself whom us trying to stay at a healthy weight as I’ve lost over a stone & half from last January, I am dairy free, eat goats cheese, & soya milk & yogurts (natural). I weigh 13 stone & 5ft 8inch tall, am I allowed between 5-15 syns per day and have any free foods listed on slimming world, I have just joined you on Facebook so I am very new to this but desperately want to loose 2 stine but, need to know and take the right path. Here’s our article on how the plan works. It’s a good place to start to help you understand the plan. For the best start, we recommend joining a Slimming World group. You’ll receive a members pack which contains all the information you need, plus the support of a trained Slimming World consultant. Hi and thanks for your website. Why are some of the foods on the list in blue/green please? Is Coca Cola a “Free” Drink ? Baked Beans in tomato sauce are included on our free foods list. Beans in other flavours of sauce may have a Syn value, so it’s worth checking on the Slimming World database. Thanks for getting in touch! Pasta is a free food, so there’s no specific amount. If you eat it as part of a food optimised meal, with 1/3 speed food, you’ll be following the plan correctly. If you are concerned about portion size, there’s usually a guide on the side of the pack. I was just wondering if tinned Tomatoes are free? I have loss just over 3 stones at slimming world but now came to a stand still for the last 3 weeks I have stayed the same and stand eating the right food. what can I do to start losing again.